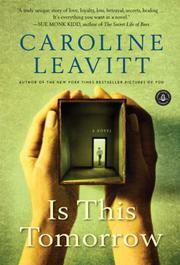 Two troubled families—are there any other kind in Leavitt’s novels (Pictures of You, 2011, etc. )?—grapple to cope with a 12-year-old boy’s disappearance. Ava moved to Waltham, Mass., with her son Lewis after her divorce. Although her selfish husband, Brian, left them and Ava is working for a pittance at a plumbing company to support her son, the censorious neighbors disapprove of her dating and disdain her for being Jewish; in Leavitt’s less-than-nuanced portrait, these suburbanites are virtual caricatures of 1950s anti-Semitism, sexism and anti-intellectualism. Lewis, told “not to be so smart” by his teachers, finds best friends in also-ostracized siblings Jimmy and Rose, whose widowed mother, Dot, is sort of nice to Ava. But when Jimmy vanishes one afternoon, ugly rumors circulate. Wasn’t there something, well, strange about the boy’s relationship with Ava? Or maybe Ava’s new boyfriend, Jake—a jazz musician, so clearly no good—had something to do with the boy’s disappearance. Jake can’t take the pressure and splits. Ava, Lewis, Rose and Dot are traumatized in individual ways that don’t necessarily draw them together, though Rose continues to pine unrequitedly for Lewis. Seven years later, in 1963, Lewis is a nurse’s aide in Madison, obsessively caring for others but unable to share anything of himself. Orphaned Rose teaches third grade in Ann Arbor, freaking out any time she sees a child more than a few feet from adult supervision. Only Ava, still stuck at the plumbing company but baking magnificent pies in her spare time for a local cafe, seems to be rebuilding her life, when the discovery of Jimmy’s remains forces everyone to face their unresolved issues. The mystery of what exactly happened to Jimmy is cleared up via not one, but two incredibly contrived revelations, and neither Lewis nor Rose is a vivid enough personality for readers to care much whether they’ll ever get together. A moderately interesting story told in extremely broad strokes.